CTP Plate Processors use significant amounts of wash water to rinse plates during processing, as much as 3 – 5 gallons per plate depending on the processor. This is in direct conflict with the need to conserve water as dictated by local water restrictions due to water shortages from drought, over-consumption or dwindling supply. In addition, most companies want to work towards becoming more sustainable, environmentally conscious, and resource conserving. Modern printing plates also require higher quality water to provide the cleanest, highest quality plate. In addition, many times imaging systems and linked processors are installed in locations where a drain is not available without expensive plumbing rework. The WaterMizer PPR from PriscoTech simply and inexpensively overcomes these challenges, helping printing companies save thousands of gallons a year of water while maintaining high quality. The WaterMizer PPR30-AR will save water: For example, normally a plant producing 100 CTP plates/week will use as much as 78,000 gallons of water per year. The WaterMizer PPR30-AR can reduce that to as little as 8,000 gallons, a 90% savings in water used. City water treatment plants are raising the pH and alkalinity of the tap water in their efforts to provide quality drinking water. Unfortunately, this is exactly the opposite of what printers require for process water. This problem is evident when the plate has to be rewashed, touched up or scraped due to small specks or small areas that have calcium deposits. This problem can be eliminated by utilizing the WaterMizer PPR and the process water from the water treatment system found in many of today’s pressrooms. 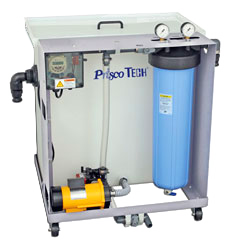 Water treated by the PriscoTech AquaFlo II is ideal. It is much easier to reduce bio-slime contamination from your processor if you recirculate the water since you are now treating a few hundred gallons of water per year, compared to thousands of gallons. Combine the WaterMizer PPR with the AlgaeClear Non-Chemical MGC Cartridge to fight bio-slime and reduce maintenance. Makes it practical and cost-effective to use “Process Water” to rinse plates. Prisco is the world’s leading manufacturer and distributor of offset pressroom chemistry, coatings, adhesives, blankets, supply items and process control equipment, in addition to being a leading solutions provider of Digital Printing Equipment.